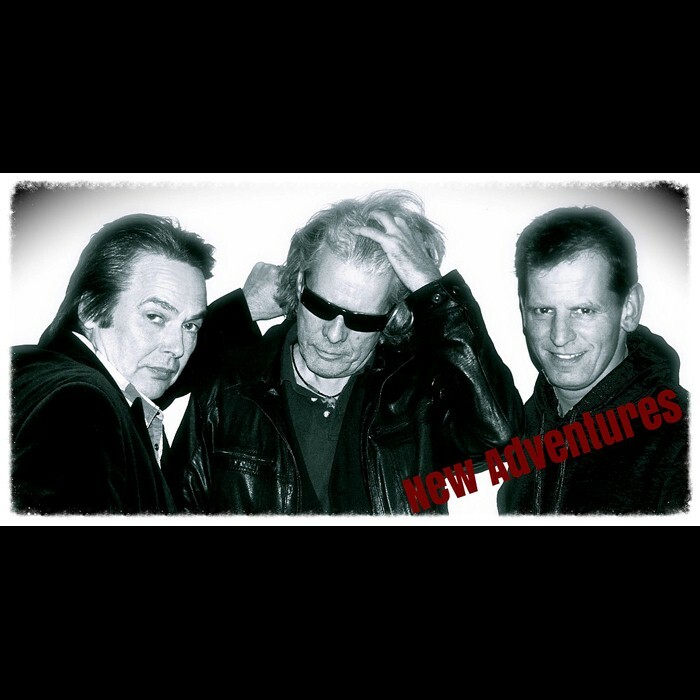 There are two bands with the name "New Adventures". The Dutch New Adventures started in Groningen, The Netherlands in 1978. Part-of the new-wave culture at the time brought them great success. The trio contributes their style to Cuby & the Blizzards, Gallagher, Cream, Jimi Hendrix, Ten Years After and ZZ Top. Vocals and guitar are by Peter Bootsman, drummer is Henk Torpedo and bass player Harry de Winter. They secured a contract with Polydor about 1979 and is support for Golden Earring. In 1980, the Earring producer/guitarist George Kooymans helped with the first LP "New Adventures" and the group scored a hit with the track "Come On". Kooymans also produced their second LP "Wild Cats Moanin'", the group developed an enviable reputation as a fantastic live act and on 8 June 1981 they perform at a pop-festival. In front of 50,000 rock fans they remain one of Hollands top groups. Third LP was "Follow". A further and longer period of silence from the band, followed by the "Best-off (best Adventures)" and a live-LP "Life is a mess" was released. At the end of 1989 Scorpions producer Dierks, Peter and Harry went to Germany to start a new project. Two CD's ("New emptying" and "Deep Colors Bleed") followed as well as a tour in Germany, France and the USA. Ending 1993 with the name "New Adventures" a new tour was started and with the Canadian guitarist Stalemate Travers a complete Europe tour was played. Bass player Harry decided however in 1995 to return to Germany and then Gerrit Peat became their new bass player. A new CD "Baby Shake" was released. It is a real old-fashioned blues tune and draws upon older track: "Come on" and "Back to the pip". Soon afterwards Gerrit Peat was replaced Ruud Engelbert. The band still tour Europe, but infrequently. Friends since university, the four boys had been playing music for as long as they care to remember; as Nick puts it, “It was always the plan”. Jez discovered he could handle the responsibility of the microphone when he invaded someone else’s performance “and for some reason wasn’t kicked off stage” and the need for a singer helped him grow into the responsibility. Raph - he of the bass - was more or less a founder member. Steve had been “playing coat hangers” since he was a kid and eventually found his muse in the form of lead guitar. Nick’s addition to the band preceded a 4-date tour in which they had their van and all of their equipment stolen, but rather than being cast aside as some bad luck omen he was in fact given the responsibility of the beat on a full-time basis. “I think the collective suffering bonded us in a ‘Stick it to the Man’ kind of togetherness. I was in for the long haul!”. And so the band existed for some time. The quartet finished higher education and decamped to London, with Steve and Jez indulging their love of vintage gear by flogging from a shop in Covent Garden. It was here that, one day, Helen popped in for some jeans and left with grander ideas. “Maybe it was fate or good luck, but they were the best pair of jeans I ever bought”. She took up the keys, provided some lush backing vocals, and revealed to the rest of the band what they’d been missing all along. “She was the final piece,” says Jez, and for Steve “our best musician”. The vintage vibe swept through the rest of the band and brought look and sound into close quarter. The resulting democracy set to work spinning their threads of influence together, slowly awakening their own sound, checking and re-checking their individual touchpoints for a source of inspiration. “The classical music I resented as a rebellious teen ended up having a great impact on me”, says Jez; a sentiment with which the rest of the band would concur. Of his soaring, heartbreaking vocal he’s far more humble. “It just comes out when I sing my own words. I rarely enjoy listening to my own voice but I love singing, which is a strange contradiction”. Strange indeed when you hear what happens when Jez puts that voice into action. Timeless yet vulnerable, it perfectly pilots New Adventures’ vessel of planet-sized pop. Like Arcade Fire without the aloofness; Radiohead minus the melodrama, New Adventures invoke Wayne Coyne’s spirit of music as emotional call-and-response and cast it across Wilco’s sepia-washed sunsets, all deftly conjured with their own seventh sense for a pop melody. It’s all there, in the way “A Million To One” takes off into the galaxy on its coda and the expansive, pleading chorus of “It’s In Our Hands”. That’s not even mentioning the symphonic “How I Got My Devil Back” and how it faces down all your and its own fears against the backdrop of the Northern Lights. And that’s just for starters. The band will tell you that the scope and stature of their output just redoubles with every song Jez presents for them to breathe life into. “He just keeps getting better and better” says Helen. Indeed Jez’s sense of perfectionism leads him to thinks that he’ll spend the rest of his life “trying to write the perfect love song”. Call it a hunch, but we don’t think it’ll take him that long.